Acksblog | Ancient myths were actually observations of Mars, Venus and Mercury which repeatedly passed close to the Earth between 3700 and 700 BC. Fig. 1 The Atlantic Ocean, created during the Vedic Period .is only 2,700 years old. The continents of the Earth comprise primarily granite. It is the most abundant basement rock that underlies the relatively thin sedimentary veneer of the continents. It is a familiar rock to everyone on Earth due to its light color and texture. It is found only in the continents of the Earth, not in the oceanic crust, or on the continents of any other planets in the solar system, all of which comprise basalt. It is classified as an Intrusive/Plutonic-Igneous rock thought to form when magma rises in large cratons through layers beneath the earth but solidifies while underground. The ascent and emplacement of large volumes of granite within the upper continental crust is admittedly a mystery to geologists because no one has ever actually observed its formation. The naturally radioactive elements potassium, uranium and thorium are concentrated in granite intrusions, but are not present in the rock matrix itself. They are instead segregated into accessory mineral phases that are dominated by the more abundant zirconium and cerium. In fact, most radiometric dating of uranium (U->Pb) in granitic rocks use zircon crystals which have fallen from the atmosphere, sometimes referred to as ‘zircon dating’. Based upon these measurements, geologists believe that much of it was intruded during the Precambrian age, 4.6 billion years ago (the point at which the Earth began to form) to the beginning of the Cambrian Period, 541 million years ago. Cyclic catastrophism claims that the masses of the continents and their locations on the Earth today were established during the Vedic Period, between 3687 and 687 BC! As discussed in many posts on this site, this was accomplished by one hundred captures (14.4-years) and releases (15.6-years) of the super-planet Mars, full of life, which at that date included Mercury, its solid iron core, in a geostationary orbit, 44,400 km above the Himalayas. At each capture, Mars became tidally bound to the Himalayas which acted as the ‘handle’ of the entire lithosphere, the outer shell of the Earth. Due to the mass of Mars, the combined Mars/lithosphere system rotated slower, and at a 30° angle relative to the mantle. This 24 km/h “tidal drag” meant that a large volume of rhyolite magma comprising the asthenosphere intruded into the continents where they were thinner.. Each time Mars escaped for 15.6 years, the intruded lava cooled, crystallized, and expanded as silicate granite crystals forming the cratons which raised the continents one layer at a time. During the same capture periods, alignments of Mars with the Moon and the Sun and Moon combined caused great convulsions within Mars which blasted water, soil, minerals, atmosphere and vegetable sprouts, as manna, or Soma, from hundreds of volcanoes to the Earth. These formed the new crust of the Earth in the form of the soil and sedimentary rocks which settled on the surfaces of the continents as they grew from below due to the formation of granite. This is a confirmation of Alfred Wegener’s Continental Drift theory, which became ‘watered down’ to ‘plate tectonics’ by geologists because they could not imagine what force could move the continents. The same captures of the massive Mars above Mt. 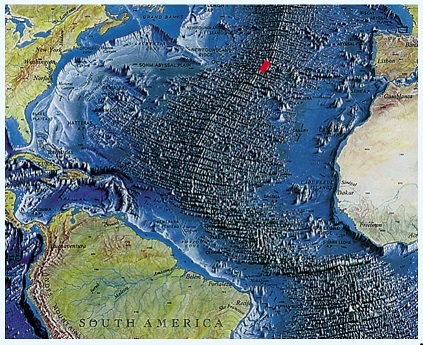 Kailas, Indra’s Home on Earth in the Rig Veda, tidally attracted the North and South American continents westward, resulting in the Mid-Atlantic Rise, a progressive bulge that extends the entire latitude of the Atlantic Ocean, with the ridge resting on the highest point. This bulge is the result of upward convective flows of the asthenosphere filling the gap created by Mars’opening up the Atlantic Ocean. The much greater motion of the North and South American tectonic plates is revealed by the more pronounced subduction effects manifested as accretionary orogenic ‘terranes’ along the Alaskan, Northern Canadian, North American Basin and Range province, the Baha Peninsula and South American Cordillera subduction zones caused by compressional, accordion-like folding. Geologists, unaware of the forces exerted by Mars during the Vedic Period, are at a loss to explain all subduction zones of the continents and date the origin of subduction in the Triassic, over 200 million years before the present but the ancient texts explain that all of these changes in the world occurred during Biblical times up to the time of Isaiah. Isaiah 65:17 (KJV) For behold I create a new heaven and a new earth: the former shall not be remembered or come to mind. Job 38:4-7 (KJV) Where wast thou when I laid the foundations of the earth? declare, if thou hast understanding. Who hath laid the measures thereof, if thou knowest? or who hath stretched the line upon it? Whereupon are the foundations thereof fastened? or who laid the corner stone thereof; When the morning stars sang together, and all the sons of God shouted for joy? 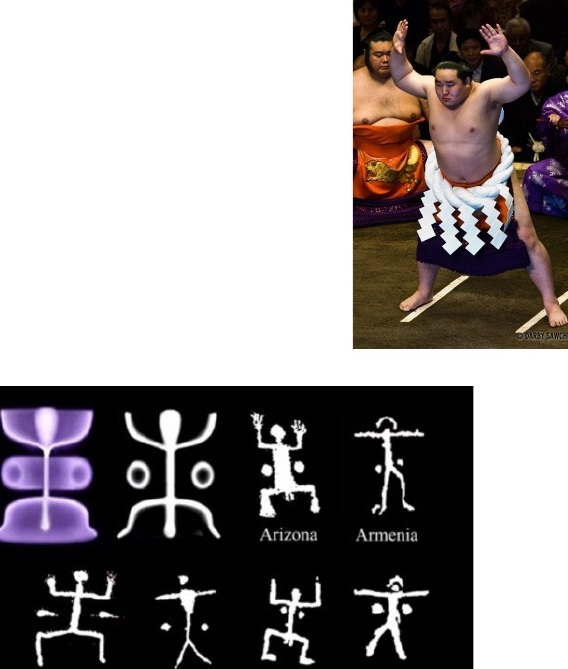 An article in academia.edu explores possible connections between Sumo wrestling and ancient Japanese mythology by Sf. R. Careaga titled “Sumo: Ancient Ritual to the Thunder God” has many aspects which correspond to the cyclic catastrophism scenario. I have always hoped for more communication with the Japanese culture. The language barrier has greatly limited access to this blog site. Amazingly this article is from a Japanese scholar in Kentucky. The author attempts to link the mythology to Patton’s Saturn theory but I believe cyclic catastrophism gives the best explanation..
1. The ceremony is performed upon the center single step pyramid platform, the Dohyo, which is made of Earth. This corresponds with the island at the north pole of Mars which remained facing the Earth during each geostationary orbit, called the raqia or firmament in Genesis 1:6-8 And God said, Let there be a firmament in the midst of the waters, and let it divide the waters from the waters. And God made the firmament, and divided the waters which were under the firmament from the waters which were above the firmament: and it was so. And God called the firmament Heaven. 2. The Dohyo is ringed with rice balls that signify bounty and plenty which was the vegetative life that existed on Mars as recently as 4,ooo- years ago. It was completely blasted to the Earth by hundreds of volcanoes between 3687 and 687 BC. 3. At each cardinal direction an offset in the ring represents the four heads of Brahma (RgVeda) and Osiris (Egyptian). These same features seen from the Norse aspect were pictured as four long-necked stags reaching for the highest branches of the “tree of life”. 4. Above the Dohyo is a hanging roof, but in the past it was an actual pillared roof above the platform. This represents the Earth when Mars was in a geostationary orbit above Mt. Kailas, known as “Indra’s (Mars) Home on Earth”. 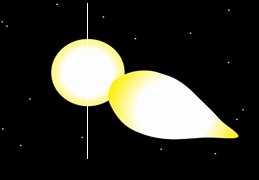 Because of this orbit the two planets remained stationary relative to one another. Consequently the RgVeda wonders “what great carpenter built this invisible structure of the two worlds”. 5. Buried in the Dohyo are salt, kelp, dried squid and chestnuts which symbolize the minerals and different life forms blasted to the Earth during the Vedic Period. Fig. 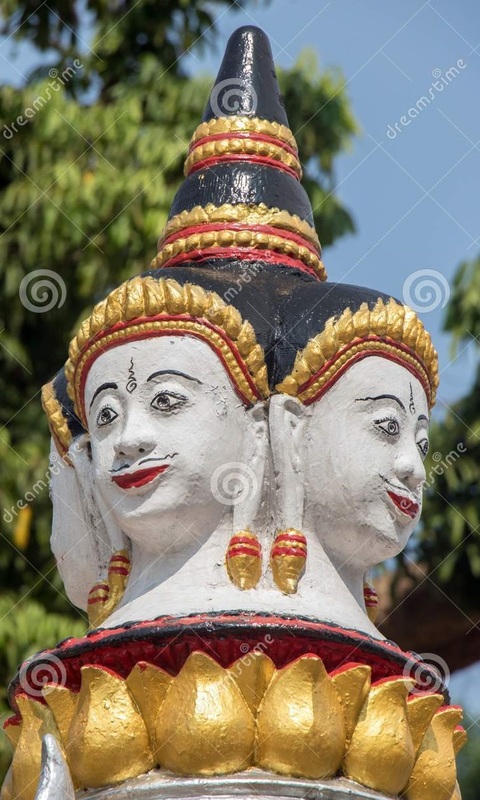 3 Brahma, with four ‘heads’ extending from northern island on Mars down toward the Earth. 6. The wrestlers have paper lightning bolts tied in their hair, symbolizing the tree of life, also known as Agni with the flaming hair, that rose up in the center of the northern island. 7. The combatants wear a tsuna, a loin cloth with five white lightning bolts and pose to simulate the thunderbolts recorded by early humans. They stomp their feet to simulate the accompanying thunder. Fig. 5. Electrical discharges effected both Earth and Mars Mars blasted hot glowing rocks to Earth, causing discharge of ionosphere at impact. Only cyclic catastrophism can explain these massive electrical discharges. Some of the large, incandescent iron meteorites blasted from Martian volcanoes, known as “Thor’s Hammer” in Norse myth, and vaijra in the RgVeda, created an ionized path between the ionospheres and the surface of the Earth and then back to Mars, through which the entire ionospheres discharged. 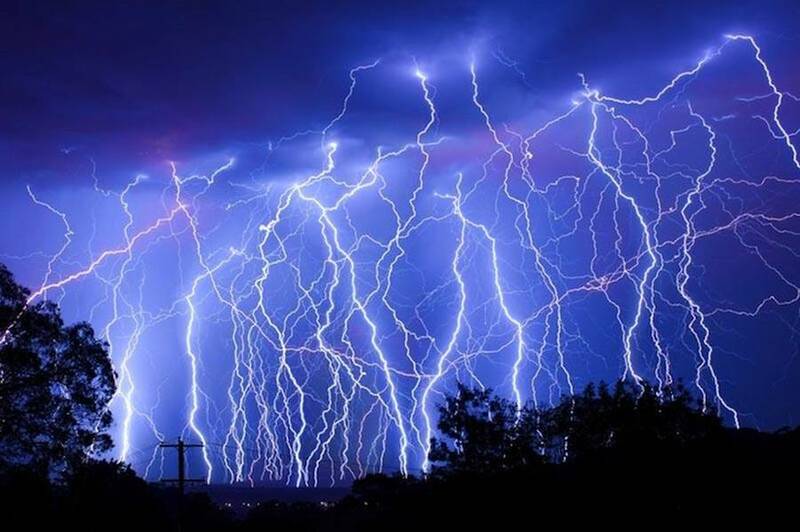 The resulting lightning spread across the entire sky and their shapes were simulated in ancient rock carvings. The human compulsion to find absolute truths, however noble, too often cumulates in tyranny of the mind, or worse. Only an extreme skepticism toward science – and an open mindedness toward other modes of knowledge and ways of life, however alien – can help us avoid this danger. “Grand Canyon is the result of a distinct and ordered combination of geologic events. The story begins almost two billion years ago with the formation of the igneous and metamorphic rocks of the inner gorge. Above these old rocks lie layer upon layer of sedimentary rock, each telling a unique part of the environmental history of the Grand Canyon region. Then, between 70 and 30 million years ago, through the action of plate tectonics, the whole region was uplifted, resulting in the high and relatively flat Colorado Plateau. Finally, beginning just 5-6 million years ago, the Colorado River began to carve its way downward. Further erosion by tributary streams led to the canyon’s widening. Fig. 1. Orbits of Earth, Mars and proto-Venus between Mars’ geostationary captures encounters geostationary encounters showing capture and release points. In preparation for the re-surfacing of the Earth, the lithosphere was inverted four times without changing its rotation rate. 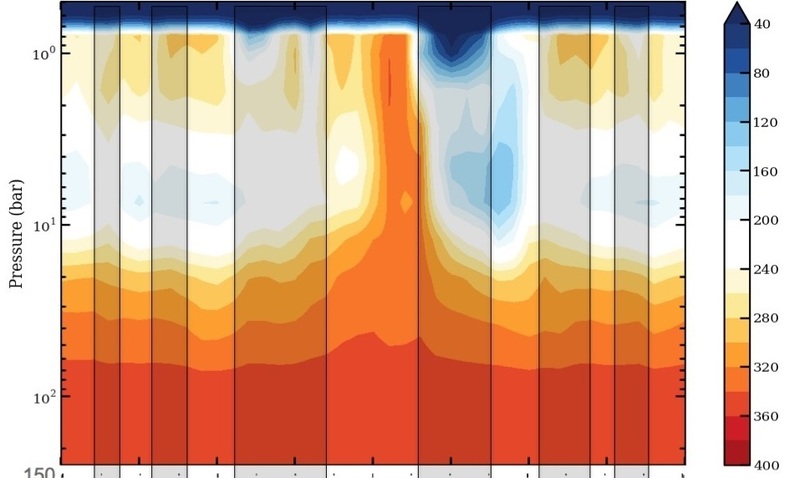 These inversions caused the oceans to rush across the continents, covering them with up to four layers of ocean-bottom material, the boundaries between which are currently called Mid Lithosphere Discontinuities, These ensured the complete destruction of the former reptilian flora and fauna dominated by the dinosaurs.. They also thickened and reduced the viscosity of the asthenosphere by heating it. 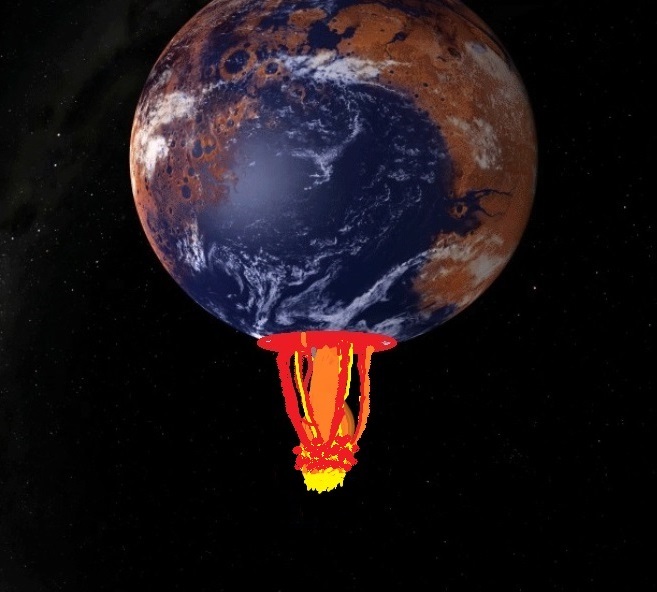 The living planet Mars, with its core Mercury in a Venus-like orbit, was then sheparded by the still molten proto-Venus into an orbit that intersected that of the Earth (Figure 1). Mars then became captured in a geostationary orbit above Mt. Kailas 44,400 km from the Earth (center to center). 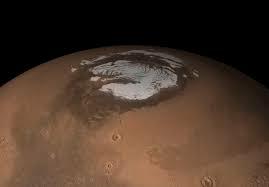 Mars’ moment, thereby attached to the lithosphere, forced it to rotate independently of the mantle with Mt. Kailas (31 ° N Lat.) remaining in the ecliptic plane, forcing a marathon 14.4-year tropical temperature on the Himalayas (Figure 2). This motion also forced a point in Central North America (Canada) 59° Lat. into a 14.4-year marathon of sunless winter, resulting in the accumulation of estimated 9,000 ft Laurentine glacier, which completely covered northern North America as far south as Wisconsin. 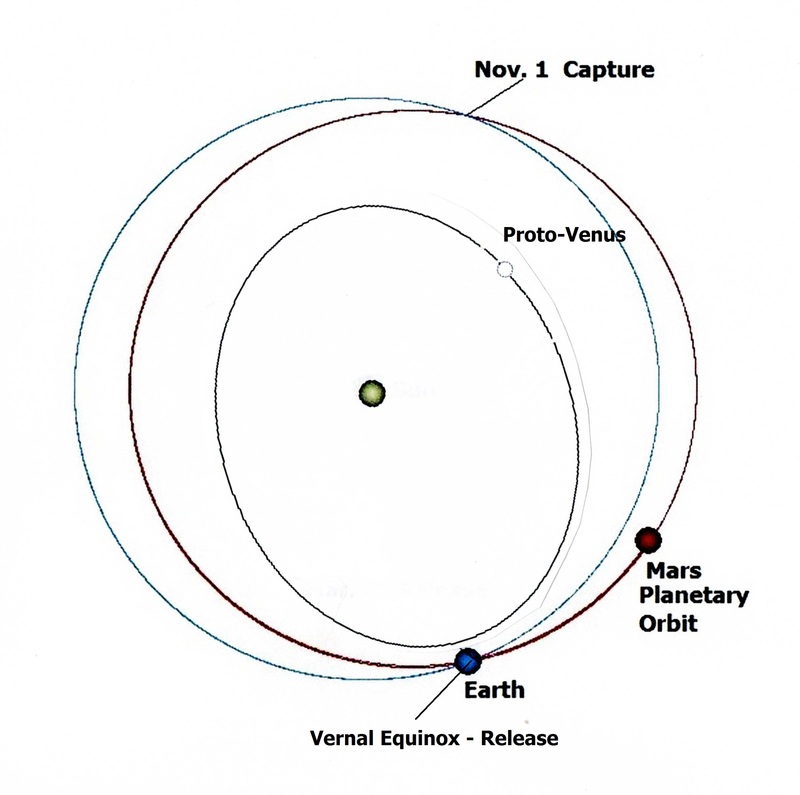 Then due to a close inferior conjunction and aphelion of proto-Venus, Mars was released into its intersecting orbit (Figure 1) for 15.6 years. This 30-year cycle was repeated ninety-nine times. During these capture periods, convulsions within Mars, induced by alignments with the Moon or the Sun and Moon combined, blasted the atmosphere, oceans, soil, rocks and vegetation (as living sprouts, manna) to the Earth. This material formed many layers of wet soil and rocks in ninety-nine rhythmic horizontally bedded layers of sedimentary rocks that covered the continents of the Earth, including the area of the Grand Canyon and floods from the melting Lauurentine glacier formed the Colorado river and the rhythmics of Walla Walla, separated by “less than forty varves (years)” in Washington State. During the same periods the tidal drag of Mars caused the entire lithosphere of the Earth to revolve 24 km/h westward relative to the mantle as a unit, thus all ancient cultures had calendars of 360 and 365.25 days/year . The silicate material at the top of the mantle acted as a bearing and its ample silicate lava flowed up into the continents where they were shallow. During each release period, the silicate lava beneath the continents cooled and crystallized expanding as low density granite causing an uplifting of the continents where they were shallow, these cratons, although homogeneous, have recently been found to have been emplaced incrementaly. During these 15.6-year periods the Laurentine glacier, returned to normal seasons, melted and the massive discharge of water flowed across what is now known as the USA, found its way to the sea. In the farthest northwest these flows caused the Scablands of J. Harlen Bretz when the glacial damns were breached. Farther to the East, the melting glacier sent flows across the originally low-lying western states which found their way to what is now called the Colorado River. North American craton remains hidden below the surface. Mars’ tidal drag also repositioned the continents to their present locations, creating the subduction zones on their west coasts. North and South America were moved even farther west by the horizontal tidal force of Mars 35,000 km above the Himalayas, stretching open the mid-Atlantic rift and creating the Pacific ‘Rim of Fire”. This motion also produced the Rockies, North and South American Cordilleras and the Basin and Range Provence on the west coast. Based on the ancient myths of RgVeda, Egypt, Celts, Greeks and clues in the Bible, these ninety-nine 30-year geostationary encounters with Mars took place between 3700 and 687 BC. Otherwise they could not have been observed and ancient texts composed about them. Because the Earth is covered by sedimentary rock from hundreds of volcanoes on Mars the suspiciously ubiquitous zircons give a wide range of ages, all characteristic of the more ancient Mars, not of the Earth. Not only is the evidence present around the world in agreement with the myths, but the caveat in this verse holds true, since academics are completely blind to both the changes in the heavens and the Earth. This period is currently called the Cenezoic and dated by evolutionists, who need the great span of time, in all departments at 66 Ma. Of course, this is because the magnitude of the world resurfacing is incomprehensible to them. 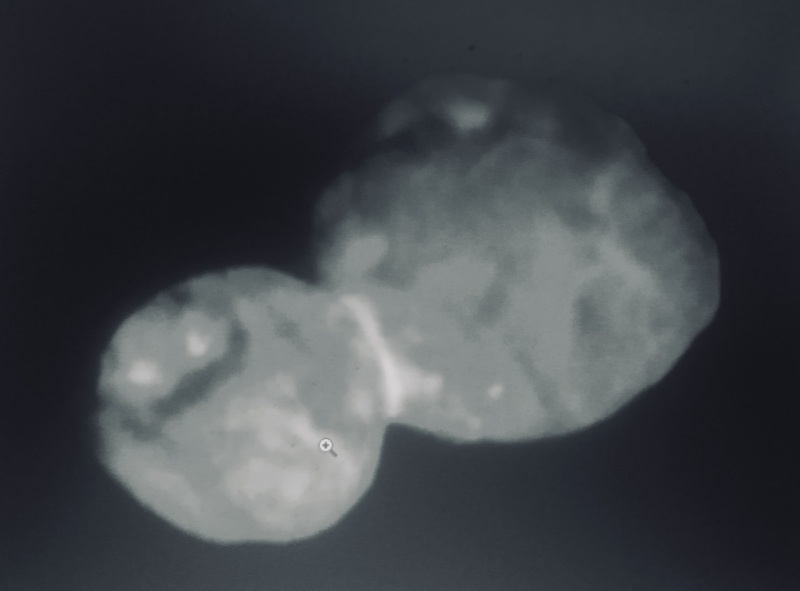 An article in Nature News Reports another ‘snow-Man’ asteroid – the most distant body in the Solar System, in the Kuiper Belt. 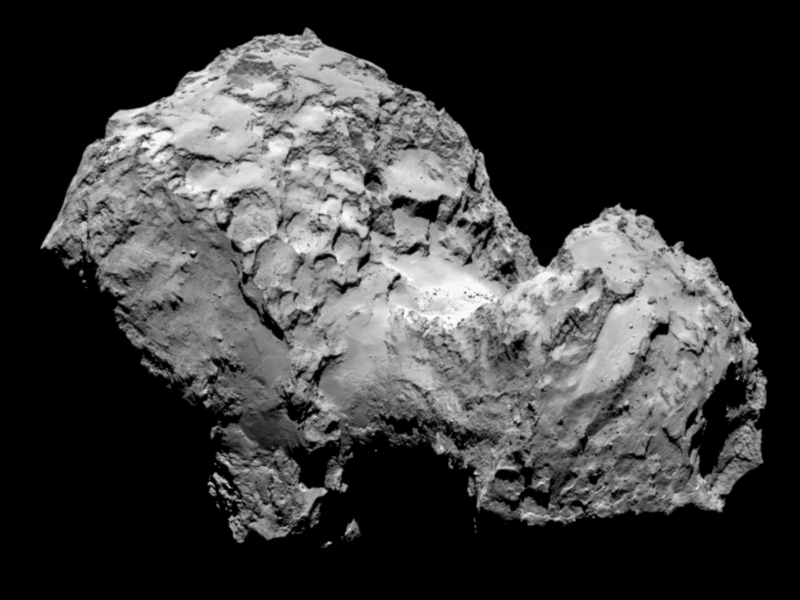 New Horizon scientists claim that it was created 4.6 billion years ago. Fig. 2. Juno asteroid Ultima Thule MU69, is ~31 X 19 km , eight times the size of 67P C-G of 67P. the first three of millions of bodies produced from Jupiter’s blazing plume that have been observed close-up. The rest make up the entire Main Asteroid belt, the Kreutz Sungrazers that cause sunspots, and millions that orbit in the L4 and L5 Lagrange points of Jupiter. This fusion reaction, which blazed for almost 6,000 years, was observed by over one-hundred and fifty generations of human beings, and was therefore given names in all ancient cultures. The Greeks called it the aegis (shield) of Zeus (Jupiter), because it could be seen moving from left to right as Jupiter rotated, as if in battle. 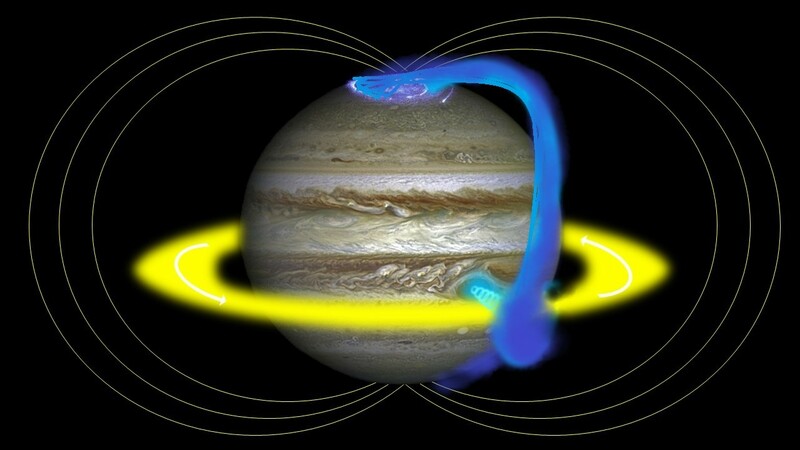 The impact on Jupiter caused the entire atmosphere to expand and glow an order of magnitude larger than normal. 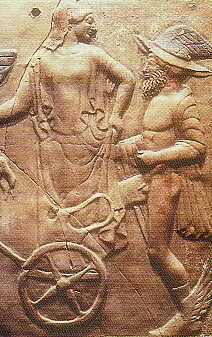 In Roman myth, this was described as Jupiter surrounding himself with a cloak to mask his affair with Io. But the blaze, which extended 2 million kilometers out into space from the impact site was imagined to be his wife Juno who was peering through the cloak to observe his infidelities (Figure 3). In the RgVeda, the blazing plume was described as ‘left behind’ from the explosion out of which Aditi (proto-Venus) was born, and imagined to be an elephant mrtnnda, which was seen swinging his trunk from side to side,also due to Jupiter’s rotation.. The blazing hot gases expanded, cooled and condensed forming solid particles which, because they were all moving in similar directions, splatted and stuck together at different scales forming larger bodies, exactly the shapes of the asteroids. Jupiter’s fast rotation, every 9 hours (~ 42,000 km/h at 22 ° S Lat.) flung the asteroids to all parts of the solar system and when added to its orbital velocity deep into the outer system. Because the blaze was directed south of the ecliptic plane, the hypothetical CMB is found to be hotter in that portion of the solar system. Many posts on this site can be accessed through the search window, (i.e. select Jupiter or Juno) but the salient fact are recounted here. A. 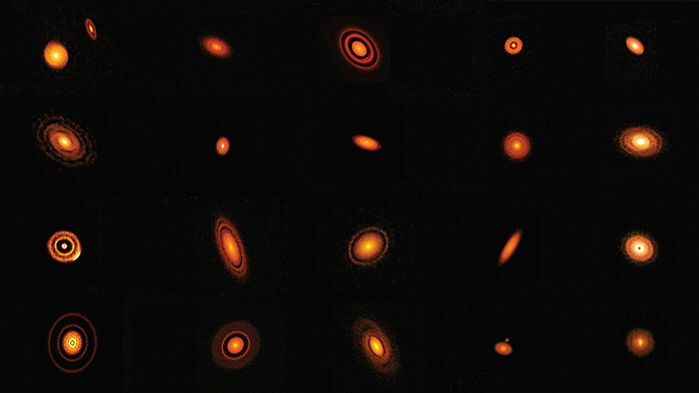 The gas giant hypothesis on which all current research is conducted, is the primary problem since gas giants form at <50 K.. This is because the Methane Gas Hydrate structure is low density and rigid. The fundamental problem here is more profound. It is the assumption that the magnetic field, the dynamo, is generated in the interior, which is not possible if the planet is solid. Cyclic Catastrophism proposes that a fusion reaction p + d ⇒ 3He++ + 4.98 MeV, left over from a recent 6,000-year old impact, of closely bound protons and deuterium in the methane gas hydrate, are producing 1030 invisible, doubly-charged helions per second which exit the atmosphere through the Great Red Spot, and given the angular momentum of the fast spinning planet, orbit prograde at 1.08 RJ, producing an appropriately shaped powerful magnetosphere and the external magnetic field (Figure 1.). 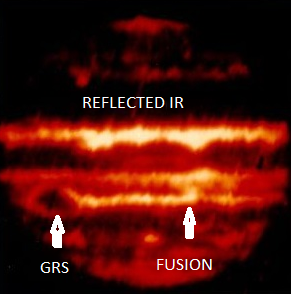 This stream of ions is currently interpreted as the inner radiation belt and is avoided, not the least because, the JEDI ion instrument cannot measure the flight time of the helions thru the 6-cm instrument. The reason that the “pattern of the winds in the atmosphere is largely preserved at depth” is because the heat of the fusion reaction is releasing the full abundance of heavy elements in the clathrate MGH which combine to form high temperature compounds, such as CS. These crystallize as they rise and cool in the GRS vortex and flow out into the upper atmosphere as particulate aersols, causing the colored clouds we observe, but which Juno instruments cannot identify, so they are currently imagined to be ammonia ice. 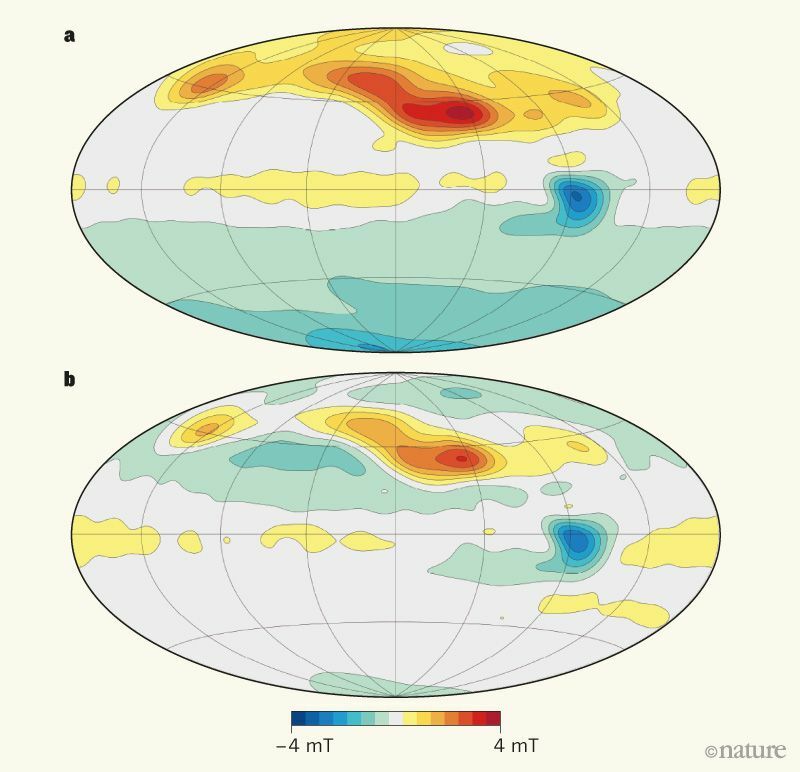 These heavy particles have been falling to the surface and accumulating beneath the clouds since ~ 1935, accumulating on the solid surface, producing the broader gravitational signals interpreted as due to the wind “at depth”. Fig. 2. 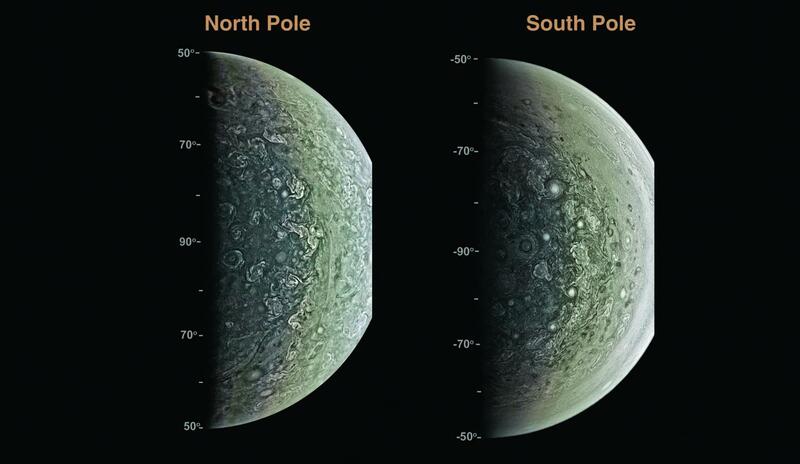 (a) ‘Striking’ upward magnetic features in Jupiter northern hemisphere (b) less complex downward field in southern hemisphere. .
D. The “striking features in the magnetic field” are due to swirling of some of the helions flowing toward the north pole which, because they have much farther to go from the GRS at 22 degrees South Latitude, are deflected by the turbulence of the clouds in the northern hemisphere. assumed to originate from deeper in the planet. However, radiometers measure only heat, not ammonia. 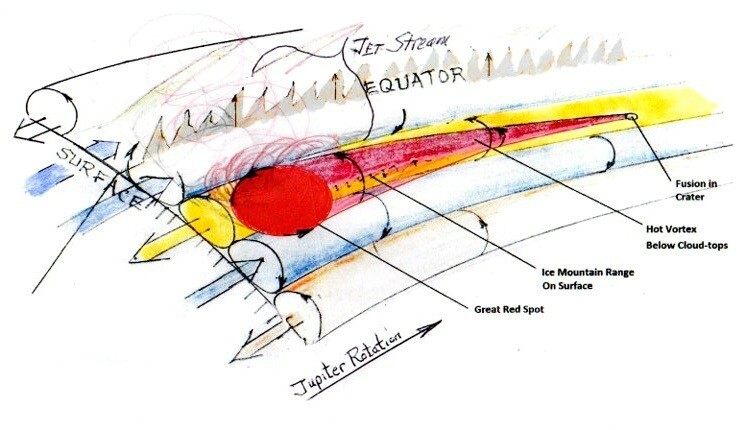 In the solid methane gas hydrate hypothesis, the solid surface of Jupiter confines the circulation of a jet stream heated by the fusion reaction above the surface of the planet, which lies 700-800 km below the cloud tops. But the IR data is still interpreted as if the longer wavelengths are coming from ammonia clouds deeper in the planet. (Figure 3.). Fig. 4. 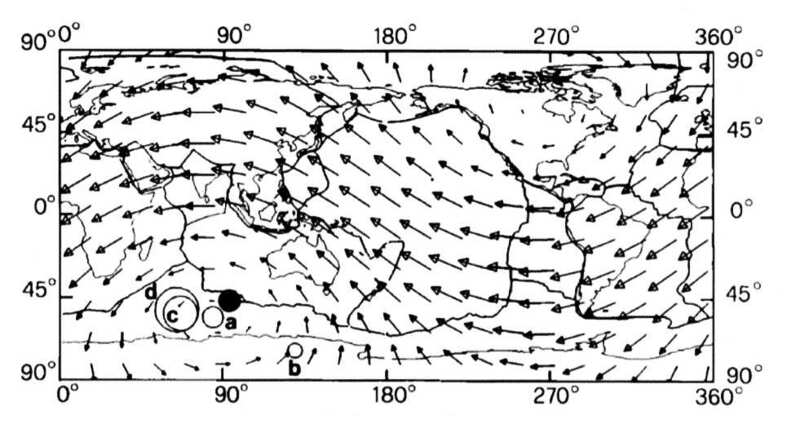 Toroidal surface winds showing eastward equatorial jet stream bordered on the north by the Coriolis force becoming vertical at the equator. F. The multiple zonal wind bands are actually horizontal Coriolis vortices (zones) constrained below by the solid surface of the planet. 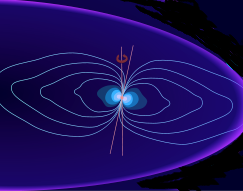 The primary vortex, driven by the fusion, spawns adjacent bands spinning in opposite senses where they come in contact (belts). The significance of Coriolis is demonstrated by the cloudless north equatorial belt (Figure 5 left image), which lacks any circulating vortex because the Coriolis effect becomes vertical at the equator, preventing the spawning of a cloud vortex from the south, where the energy source (GRS) is. The radiation coming up through this gap in the clouds, currently interpreted as a signal associated with ammonia, is from the hot primary vortex (yellow in Figure 4) which travels north beneath the clouds and is reflected upward by the clouds north of the gap, as shown in Figure 5 right image. 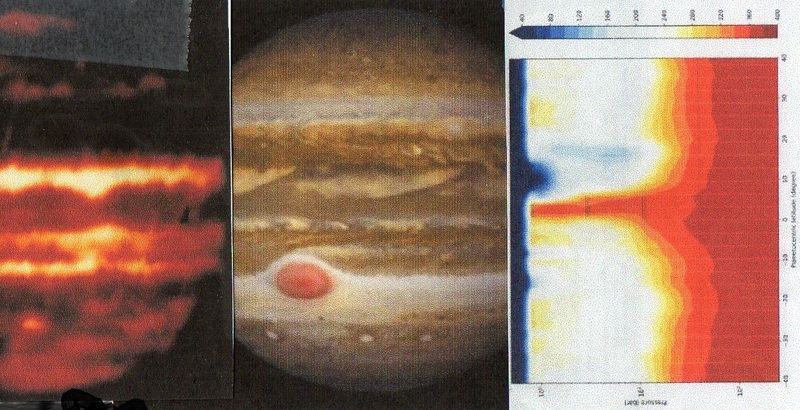 The raised clouds along the equator, are visible along the equator in the middle, visible light images (Figure 4.) and are also indicated by a lower measured velocity dip (shown elsewhere) along the equator.